Queries still arrive about where to buy Take Five: The Public and Private Lives of Paul Desmond. As hardened Rifftides readers know, but newcomers may not, new clothbound copies are history, unless you are lucky enough to spot one on the shelf of your corner bookstore. And if your town still has a corner bookstore, congratulations. 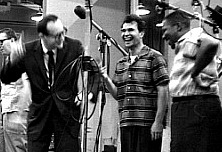 Desmondpictured left with Dave Brubeck and Gene Wrightloved technological advances; he would no doubt be at least this happy if he knew that his biography has gone digital. Please see this announcement from a year ago for details. Thank you for reminding us of this book. I haven’t read it and now I will download it. Paul Paolicelli just posted on Facebook his original Pittsburgh Post-Gazette review of the book. Doug’s book is an excellent read. Desmond was like almost all jazz musicians pretty f-ing smart. Doug does an excellent job showing him as he was with a love for the written word as well as the music he made with Brubeck and many others like Jim Hall. Another man with a love for words and music was Gene Lees. Doug, as usual, your introduction to Singers And The Songs II was an example of writing by a man who loves words and music as well. I second your opinion on Gene Lees, a man I could call a dear friend. He was one of a couple of writers about music who helped me to become a better writer.